If you need a nice ride in the beautiful city Xiamen, just simply contact us now to get our BEST QUOTES and GREATEST SERVICES today! Car rental serivice provider in Xiamen city China ! We drive your way in Xiamen! 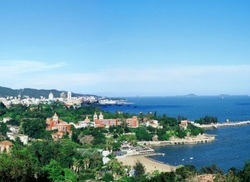 Xiamen is a coastal city in southeastern China. It faces the Taiwan Strait and borders Quanzhou to the north and Zhangzhou to the south. Covering an area of 1 565 km². It has been ranked as China's second 'most suitable city for living.Under the principle of Opening door policy, Xiamen was established as one of the earliest Special Economic Zone in China since 1980’s. Xiamen has a monsoonalhumid subtropical climate, characterized with long, hot and humid summers and short, mild and dry winters. Summer and autumn are comparatively sunny, while autumn is warm and dry. Being an important harbor since its first ages, Xiamen is known as one of the top 10 ports in China, with 80 berths of various sizes boats to over 60 ports in more than 40 countries and regions. Its primary economic activities include fishing, shipbuilding, food processing, tanning, textiles, machine tool manufacturing, chemical industries, telecommunications, and financial services. The city benefits particularly from investment capital from Hong Kong, Macau and Taiwan. Xiamen international Conference & Exhibition Center is also a must-see place as it is one of the nation's best infrastructure. This particular achievement is an open space reflecting Xiamen high-quality standard for hosting international events. Full of hidden curio and food shops. There is an annual tradeshow held here for investment and trade called the China International Fair for Investment and Trade (CIFIT). It is one of the largest in China. It is also china’s second most lovable city according to the survey made in 2006. Shanghai Car Rental Service will be very honored to have the opportunity to serve you in Xiamen with our great limousine services, we will insure a hassle-free, most comfortable trip no matter you are traveling Xiamen for official business visits or personal tourists. All our drivers are from local and they are all licensed, well trained and with more than 6 years’ experience in serving our foreign customers, they are also quite familiar with the routes in Xiamen and other cities in Fujian Province ,can easily drive you wherever you want. ◆Xiamen airport transfer services ,hotel pick up and drop off . ◆ Xiamen railway /bus station/ transfer services . ◆ Xiamen cruise terminal transfer services ,car rental services for touring Fujian /Tulou and neighborhood etc. ◆Grand transportation or transfer /shuttle services for Fair/ Event /Exhibitons in Xiamen regions ( Convention center to hotel and hotel to convention center) ( MPvS, Luxury Sedan , buses and coaches are availale for such services ). ◆ Xiamen Daily Limousine or car rental services (chauffer services) for short term period, include Xiamen Business tours or factory visits to neighborhood cities in Quanzhou,Fuzhou, Putian and other cities in Fujian province . City tour sightseeing sedan /mini van/mini bus/coach services for individual or group travelers. ◆Long-term car lease for individuals or cooperates in Xiamen.